The hardest thing about this recipe is probably to cut the watermelon to get a perfect pizza base. When you need a super quick and easy appetizer to fight sugar cravings or keep your guests’ stomachs happy while you are making brunch/lunch/dinner, the watermelon fruit pizza is your option. This relatively light appetizer is tasty and diet-friendly when eaten in moderation. Plus, it is no hassle at all. Taking a little step toward a healthier life has never been easier. Bring a nutrient-dense appetizer to the table by making these yummy and healthy broccoli quesadillas. If you do have no broccoli, you can use any vegetable of your choice. I tried zucchini and cabbage. They work great for this recipe too. Well, this recipe is for crazy gals like me who enjoy artichokes whether baked or canned. Why crazy? I do not know about you, but every time I say I love artichokes people tell me, ‘How do you eat ’em?’ In reality, they are incredibly delicious. Give this recipe a try, if you don’t believe me. Although these eggplant rolls are not absolutely healthy, they make a fantastic treat to enjoy once in a while. Since I am not a big fan of mayonnaise, I use low-fat Greek yogurt. You can opt for whatever your stomach desires, but don’t forget about the calories and trans fat. Investing in a high-quality spiralizer is a great idea for those who love crispy appetizers and fun salads. If all you have at home is potato, you can still save the situation and treat your guests to perfectly crispy curly fries. We all know and many have even tried to make mozzarella sticks, but what about the mozzarella waffles? My friends didn’t know that my waffles’ main ingredient was mozzarella until they ate them. I’m not Turkish but I love their cuisine and incorporate some recipes in my meal plan as well. These Baklava cookies make wonderful sweet appetizers, albeit it takes some time and effort to make them. If you don’t care about the calories or fats, these guacamole onion rings will make your day. I love the idea of using lime juice in the recipe. Lime juice has powerful weight loss benefits and it helps to improve the taste of the rings. This appetizer recipe has made me reconsider my difficult relationship with mushrooms. 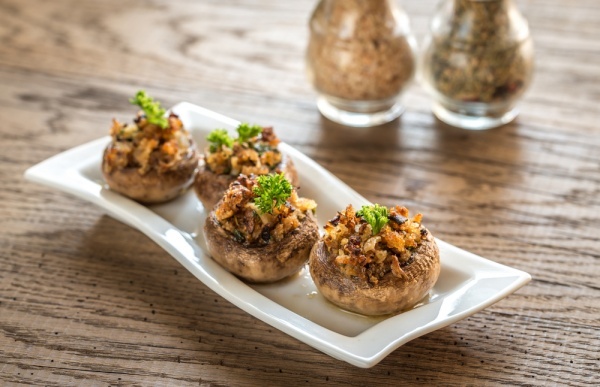 Garlic parmesan-stuffed mushrooms are mouthwatering and they are not tricky to make. Trust me, if I eat these mushrooms, you can too. There are many more great appetizer recipes to experiment with, I just don’t have a lot of time for cooking. If you know any other quick and easy recipes, please let me know about them in the comments. What restaurant has the unlimited appetizers? What restaurant is offering endless appetizers? Who has the unlimited appetizers?